Our daughter-in-law is eight and a half months pregnant. As a Labor & Delivery nurse I have seen a lot of pregnant women in the near 3,000 deliveries I have attended and she is undoubtedly the most beautiful pregnant woman I have ever seen. She moves with a grace and poise many pregnant women find impossible this late in their gestation. In fact, when viewed from behind, one can't even tell she is pregnant. But one glance at her gravid belly shows that she is full of the miracle of life. No one knows what mysterious thing actually triggers the onset of labor. There are many theories and even more suppositions. What is known, however, is that at some point after labor begins, a new life enters this world. It is as a dramatic change for the baby as could be. From a world of near-darkness to bright light, a life full of new sensations, sounds, touches, sights and tastes abound for the new little one. Our new birth as Christians is none the less dramatic and just as mysterious. The Lord works in our hearts, calling us to Himself, long before our thoughts turn to Him. Christians share the truth of the Lord Jesus with us and Bible verses cling to our minds. Then somehow grace through faith goes from being an idea to a reality. We become what the Bible refers to as "a new creature." he is a new creature: old things are passed away; behold, all things are become new." The moment after I became a Christian I knew I was different. I had grown up in the church and heard about the Lord all my life. I just assumed I was a Christian, but during my teenage years the Lord began to work in my heart. Two weeks before my sixteenth birthday, alone in my bedroom, I came to the Lord and gave my life to Him. When I arose from my knees it was obvious to me I was a "new creature." My desires were different and my thoughts were different. I wanted different friends and different hobbies. I went from having a head knowledge of the Lord Jesus to having a heart knowledge. The words of the Bible now seemed to jump off the page. I can no more explain to you the dynamics of my transformation than I can expound on the beginnings of labor. But I know that I know that Jesus now lives in me. He strengthens me, enables me and provides for me. I know I can trust Him in every moment, every situation to be exactly what I need Him to be. Just as our new little baby will never have a moment when he or she wants to return to the womb, I have never regretted trusting in the Lord Jesus for one second. And because of Him I know my best days are ahead. Sometimes we may hear someone say, "It doesn't matter what you believe, as long as you believe." This has got to be one of the most nonsensical statements I have ever heard. Balance that with the statement I heard a minister make yesterday, "What we believe effects every aspect of our lives." Now that statement is full of sense. What we believe, and in Whom we believe, will color everything we think, everything we do and everything we are. If, for example, we believe that there is no God, we will act and think and as a result be something totally different than if we believe there is a God. If we believe that God is intimately involved in every aspect of our lives we will think and act and subsequently be different than if we believe God is only a part of our lives when we read the Bible or pray or do something we perceive to be spiritual. The truth of the matter, according to the Scriptures (which is the only truth which counts,) is that "in Him we live and move and have our being." We cannot escape God. His Spirit works in our world to call us unto Himself. His creation surrounds us to declare "His eternal power and Godhead" to us all. Whether we believe Him to be or not does not change Who and What He is. It reminds me of a saying I once heard, "Your unbelief does not alter the facts." It is important that we not only believe, but that our belief be founded in spirit and in truth. There are many false teachers who would have us to believe what they say for their own self promotion and gain. There are enemies who seek to distract, deceive and discourage us by leading us to believe things which just aren't true. But there is One, and only One, who is worthy of every belief we have. There is One who will never disappoint us. There is One Who will never leave us. Let us make sure our faith and our belief is centered on the One who loved us enough to die for us. The most joyful person imaginable has also been called the "Man of Sorrows." The Bible tells us that God hath anointed the Lord Jesus with the oil of gladness "above Thy fellows." "Thou lovest righteousness, and hatest wickedness: therefore God, Thy God, hath anointed Thee with the oil of gladness above Thy fellows." He is the most joyful of humans and yet, He was also the "Man of Sorrows." He was despised, and we esteemed Him not." I cannot begin to say I understand how the Lord Jesus can be both "anointed with joy above His fellows" and "a man of sorrows, and acquainted with grief." Then the thought, the question, comes to my feeble mind, Why? Why would a loving Father take pleasure in the pain and grief of His dear son? For us. The simple, but most astounding answer is, He did it for us. "Who His own self bare our sins in His own body on the tree, that we, being dead to sins, should live unto righteousness: by Whose stripes ye were healed." I Peter 2:24.
the righteousness of God in Him." I have no words of explanation, only an agreement with the hymn writer, "Hallelujah! What a Savior!" a feeling or understanding that someone or something is important, serious, etc., and should be treated in an appropriate way. I suppose my primary characteristic prior to coming to know the Lord Jesus as my Savior was disrespect. I recoiled and rejected any notion that someone should be able to tell me what to do and I tried, even in the tiniest and most subtle ways, to rebel against authority. I think it is true that our respect for God's authority can be directly measured by our respect for those He has placed in authority over us. Not only those in authority over us, but everyone we meet deserves a measure of respect. We cannot begin to tell the world we love God if we do not have respect for others. This does not mean that we agree with everyone in our path. No, we cannot agree with what is in opposition to the character and nature of God, but there is no place for a disregard for others, regardless of their beliefs. There is not a person on this planet who can not truly sing "Jesus Loves Me," for He loves everyone. If our Lord loves everyone and desires everyone to come to know Him in spirit and truth, how much more should we as His children, show them respect and love? how can he love God whom he hath not seen?" When the Lord Jesus walked this earth, to be close to Him meant at the very least a long, dusty journey. At the most, as it was with the disciples, it meant forsaking all to follow Him. One did not have to be in the direct presence of the Lord Jesus, even when He was upon the earth, to have His presence known. There are instances where the Lord Jesus healed those who were not even near Him. We, however, are blessed in that we not only have the Lord Jesus near us, we have Him within us. As Christians the very God of the universe, the Lord of Lords and King of Kings has come to reside in our spirits. In this moment there is not a single person who has to be distant from the Lord Jesus unless he chooses to be so. The Bible tells us the Lord "delighteth in mercy." There is plentiful pardon to be found in Him. He waits to shower us with His love, His mercy and His grace. "Draw nigh to God, and He will draw nigh to you." Young nurses joining our Labor &Delivery unit have many things to learn, but one of the things that frightens them the most is learning to be the scrub nurse on C-Sections. To perform well they must master aseptic technique, learn the 52 instruments used and when they are used, learn the operation itself and the five body layers involved and then learn the idiosyncrasies and preferences of all the OB-GYNs who practice at our hospital. Many of the new nurses are hesitant to scrub on their first "solo" operation. They say they need more classes and want to learn how to do it by reading instead of doing. It is usually at that point I share with them my "scrub class." It was at a busy teaching hospital and my charge nurse told me to scrub on the upcoming C-Section. I told her I had never scrubbed before. She said, "Go, do it!" I told her I wasn't sure I knew how. She again said, "Go, do it." "One cannot learn experience, it can only be acquired." This is very true and was true of my own experience as a scrub nurse. I learned to scrub in a unit that had no scrub techs (technicians whose only job was to scrub on operations.) The hospital was very busy, so I had lots of time to acquire experience. Because I scrubbed on so many operations during my initial learning period, scrubbing is etched very deeply in my brain and is something I enjoy doing quite a lot. I recently told one nurse my goal is to anticipate the surgeons so much that they never have to ask for anything. As Christians, we must also acquire experience -- experience with the Lord. We must make the choices to walk with Him, to know and believe His Word and to believe that what He has said is true. We cannot learn experience with God, we can only acquire it. We acquire it by consistently walking with Him by faith. It is then that the learning about God becomes more than just learning. The learning becomes a life sprinkled with moments of God. We become those who both know and do. and Jesus Christ, whom Thou hast sent." This past weekend we were at my son and daughter-in-law's house and our granddaughter Emma regaled me with two puppet shows, what she called a "slideshow" (which was a series of storyboards she had drawn on a dry erase board) and a "museum tour" of her room. Let me explain that Emma has one of the most vivid imaginations I have ever seen. Her stories are full of details, she acts them out extremely well and she expects her audience to remain engaged and at times even participate. Having said that, after the four productions, "Grannie Frannie" was tired. When Emma asked if I would like to see another puppet show and I responded, "Not now." There has never been, is not, nor will be a time when we call upon the Lord and find Him napping, or tired, or disinterested in our call to Him. He is always waiting, always listening, always desiring us. The Lord Jesus told His disciples before the Last Supper, "With desire I have desired to eat this passover with you before I suffer," (Luke 22:15.). He has that same desire for us. We can never know the depth of His longing for communion with us, we can never understand the depth of His love for us, but we can believe it and respond. ". . .the prayer of the upright is His delight." Today our list of errands took us from one part of our town to another. As we made the turns and twists to reach our next destination, I was thinking about how well we know this part of town. Actually, I have lived in this part of our city all my life, residing in a four mile area since my birth. The streets are familiar because we traverse them so much. We don't even have to think "how to get there," we just know. We even know where the bumps and potholes are on the roads and hopefully can avoid them. As Christians, the more we spend time reading the Scriptures, the more they will become as familiar to us as the streets we travel daily. The Holy Spirit will plant the Word of God in our hearts so when they are needed in our lives they can blossom as flowers of comfort, encouragement, correction and instruction. Glen and I walk the streets of our city several times a week in preparation for hiking. I especially love walking downtown and in the old, historic districts because there is always something beautiful or interesting to see. Before we went on our first hike we both wondered if we were actually going to enjoy it. We started out in the mountains of Tennessee one cold October morning and it wasn't long until we both realized we did in fact enjoy it very much. Each hike ends with a discussion about the next hike. streams and creeks, the indescribable foliage of fall and the brilliant green of Spring. We have heard birds calling in the trees unlike any we have heard before. We have seen wildlife: a huge turkey, a fox, a beaver -- no, no bears. Never once on the trail have I wished I was back walking on the sidewalks of our town instead. Even though hiking presents much more of a challenge, it is still far better. The Lord has prepared such an incredible home for us that nothing here can even begin to approach it. Mainly, He has given us Himself and there we will know Him without the interference of the world, the devil and our own flesh. We should look ahead with expectation, joy and excitement because truly our best days are ahead and they will be "far better." 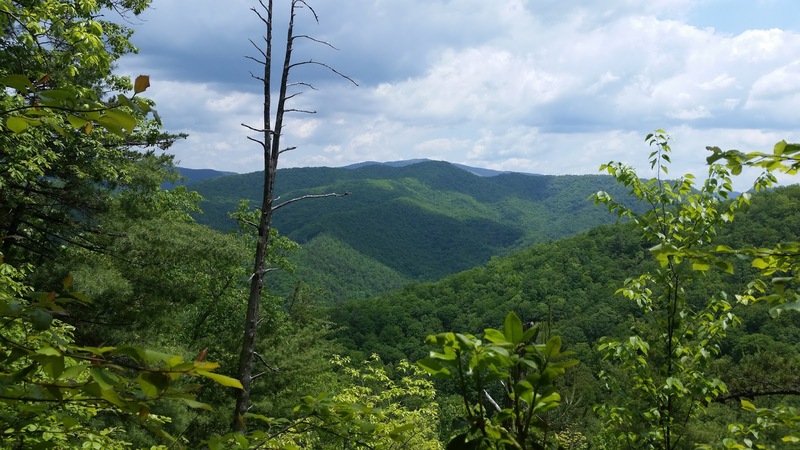 Glen and I enjoy hiking parts of the Appalachian Trail. We have hiked in Tennessee, Georgia, North Carolina and now Virginia. There are times hiking I take my eyes off the trail to look ahead for a moment. Sometimes I am delighted to see the path turns downward, but most of the times the path ahead is an ascent. Sometimes I see what appears to be an insurmountable obstacle. When I reach this "obstacle" though, most of the times there is a path, unseen from a distance, which allows me to walk right beside the obstacle with ease. This was not the case this time. Actually, we encountered two obstacles on our recent hike and they were within a short distance of each other. We were hiking along a beautiful path surrounded by trees with new spring growth. Every now and then a mountain vista would open up from the foliage. The trail was hard, but negotiable. Then we came to a spot where sheer rock face was to our left and a steep precipice to our right. In front of us water cascaded out of the rock and tumbled below on the side of the mountain. Two logs had been placed across this creek. Thankfully, the wonderful volunteers who maintain the trail had placed some metal grating on the logs so they wouldn't be slippery. Still, it was a tense moment putting all our weight, plus the weight of our packs, on these small, wet logs. We crossed the "bridge" easily and I felt a congratulatory pride in our accomplishment. Then a few feet later we met the next obstacle. The trail, usually only a foot or so wide, began to diminish and then disappear. In its place a ledge of rock began to jut out from the mountain, rising to a height of about four feet. The rock face was still to our left and the precipice to our right. It was obvious we were meant to climb up on this rock ledge, which we did. I did so holding on to the rock face as best as I could. 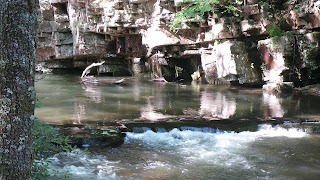 Then to my amazement, the ledge abruptly disappeared and the sodden trail reappeared -- four feet lower. The only way to go forward was to jump from this ledge to the path below. I imagine the many young thru-hikers we met on the trail made this jump without a single thought, but age brings both wisdom and caution. Not wanting to shift my center of gravity, I slipped my pack off and jumped. Glen followed, choosing to leave his pack on. We both made it safely down to the trail, but the margin of error was tiny. One misstep and we would have been making a quick descent down the mountain in a way we definitely did not want to do. As we continued on, this ledge was in the back of my mind. You see, we had planned an "out and back" hike, meaning we would have to face this ledge again, but this time from the other direction. I wasn't sure exactly how we were going to manage that, and frankly, I didn't want to face it again. This is often how things can go in our Christian lives. We take our eyes off the path the Lord has placed before us and we gaze wonderingly into the future. Rarely does that future paint a rosy picture. More often than not, we envision something through which our enemy can tempt us to fear. . . "What if this happens?" "What will happen to me if this person is no longer in my life?" Imaging the future brings dread and dread breeds fear. These thoughts and these fears can be very real. To some they present insurmountable obstacles to peace and joy. The truth of the matter is that as Christians there is never a moment, never an obstacle we must face alone. He is with us, He is within us and He is waiting for us to trust Him to strengthen and enable us to do His will in the face of the obstacle. Sometimes He provides a safe place for our feet along the obstacle. Sometimes He removes the obstacle. Sometimes He removes us from the obstacle. This is what happened with our rock ledge. Later on along the path we found a trail leading back to the Virginia Creeper trail. We had walked part of this the day before and found it to be a beautiful and refreshing trail. 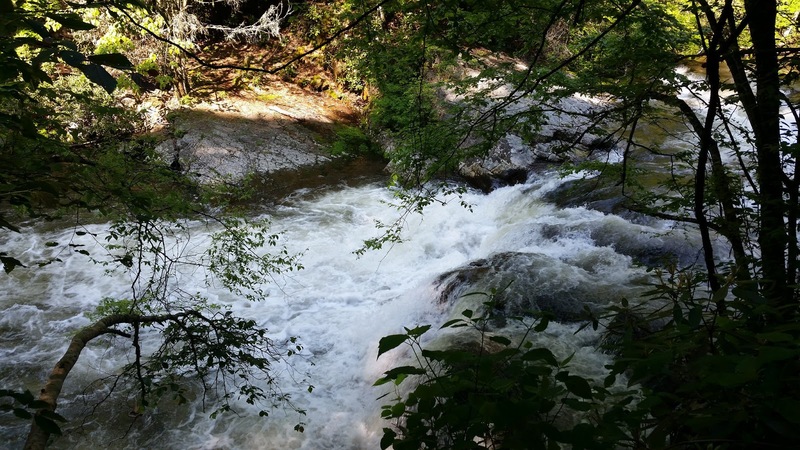 We knew we no longer had time to reach our planned destination (because of a washed out bridge, a detour, and a wrong turn) so we finished our hike on the Virginia Creeper Trail. The Lord strengthened us to cross the wet bridge. He enabled us to jump from the rock ledge, but He took us out of climbing onto that ledge a second time. Trusting the Lord as we walk along our path of the Christian life leads us to find the "peace of God, which passeth all understanding" and "joy unspeakable and full of glory." Let us not fear the path ahead, or look at it with dread. Our Lord is with us, He is within us and there can be no obstacle insurmountable to the One who flung the worlds into being with His word. He is the One who sustains all creation by the "power of His might." "A man's heart deviseth his way: but the Lord directeth his steps." Proverbs 16:9. 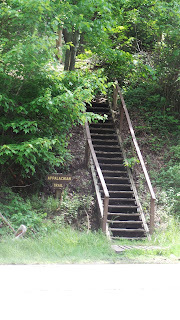 We started in Damascus, VA, one of the towns dissected by the 2,193 mile Appalachian Trail. In fact, Damascus is often considered a favorite among thru-hikers of the trail. 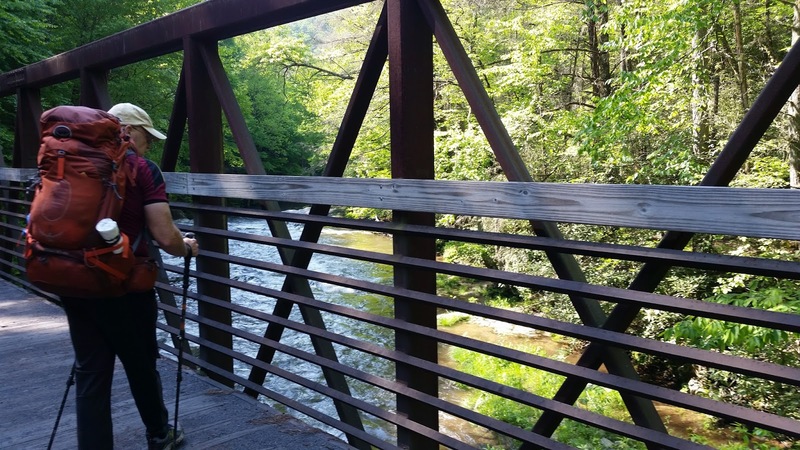 Another trail, the Virginia Creeper Trail -- primarily a biking trail -- also passes through Damascus and the two trails actually share the same real estate in a couple of places. the separation of the two trails. Climbing the stairs and beginning the ascent beyond, it was obvious we had left the gentle VCT for more challenging terrain. In spite of the climb, our hike was going well and we stopped at a lovely brook to gather and filter water for the rest of the day. Shortly afterward we found signs on the trail that a bridge ahead had been washed out and we were detoured back to the VCT. At the trailhead to the Virginia Creeper, we took advantage of a bench provided, slipped off our heavy packs and surveyed our maps. The detour signs had stated the way would be well marked, and we had clearly seen those marks up to now, but didn't see a marker here at the trailhead. We set out in the direction we thought was best, ". . .a man's heart deviseth his way." It was several miles before we realized not only were we going the wrong way on this 34 mile trail, we were actually heading back to Damascus! This changed all our plans. ". . .but the Lord directeth his steps." We had only a limited amount of time for this hike and had planned to go out a certain distance and on the third day, turn back. Now we had lost precious time. We continued along the Creeper until it was time to camp for the night. 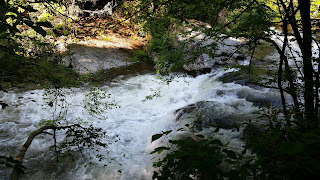 We found a lovely campsite on the banks of the creek and let its bubbling and swirling lull us to sleep. The next morning we hiked back into Damascus. We sent some messages to our daughter (because there is NO cell phone service on the trail.) Then we turned around, and for the third time, hiked this portion of the combined trails. The missing of the trail at the detour changed our plans. 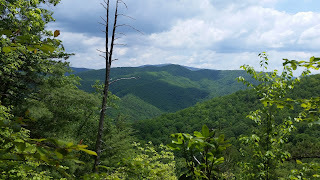 We hiked another portion of the Appalachian Trail and then hiked to the end of the Creeper Trail. The Creeper ends at the Virginia/North Carolina border, so we took a couple steps into North Carolina for good measure. Then we changed directions and hiked the 18 miles back to Damascus. We had made our plans, and they were good plans. But the Lord had other ideas for us. We enjoyed our hike on the Creeper and now have plans to go back and finish the remaining 16 miles. It was not something I would have planned myself, but I am so glad we did it. It was an enjoyable hike, giving us our greatest mileage in one day, 23.17 miles. We saw things we had never seen before, such as the fox who stopped to give us a once-over as he crossed the trail, the beaver who scuttled faster than I would have imagined, across a meadow toward the creek, and bear tracks at a campsite we declined to use for obvious reasons. The Lord intends for us to use our minds as we plan for our future, but He doesn't intend for us to lean on our own finite understanding. He wants us to always be open to the possibility that we have missed the trail, or that there may be something else He wants us to do. Thankfully, He is so magnificent He can work even our wrong turns into something wonderfully good for us. fear the Lord, and depart from evil." when ye turn to the left." When people learn that Glen and I hike portions of the Appalachian Trail, the same questions usually come up. One of the most common is, "Where do you sleep?" People seem quite surprised to learn that we sleep on the trail in sleeping bags inside a tent. Perhaps they thought there was a Holiday Inn Express on the trail, but I haven't seen one of those yet! There is nothing we have that is not on our backs carried with us each step of the way. When we came to know the Lord Jesus as our Savior, His Spirit came to dwell in our spirit and with Him was everything we could ever possibly need to live the Christian life. He is our Life and our Light. He is our Shield and Fortress. He is our Solid Ground, our Firm Foundation, our Rock. He is our Joy unspeakable and full of glory. He is Love. He is our Bread of Life and our Living Water. He is our Rest and our Safety. He is full of compassion and of great mercy. He is our All and in All. Having Him, we have all. All in Christ and Christ alone. He is my strength, my light, my song. Firm through the fiercest drought or storm. When fears are stilled and stiving cease? Here is the love of Christ I stand. Recently I purchased new suitcases for me and Glen. According to the manufacturer they were created after receiving input from close to 2,000 customers. Every detail shows they were designed for the ease of travelers, from the materials chosen, the zippers used and the thoughtful features built into them. We had a chance to use them on our recent trip because after we hiked in Virginia, we also visited Savannah, GA for a few days. Usage only increased my estimation of these bags. Each time I use them I discover some feature I had not known of, or utilized before. They are a wonderful example of perfectly matching workmanship to purpose. We are "new creatures" made in the image of God to glorify Him and to do His will. Our hearts are now made to love, serve and worship Him. We are perfectly designed to fulfill our purpose, as long as we choose to trust Him by faith to work in us that which is well pleasing in His sight. My "perfect" suitcases would not be very perfect if I never took them out of the closet. If I refused to recognize their great features and qualities and just stuffed clothes in them willy-nilly, I would never allow them to fulfill their true purpose. We all have a purpose in Christ Jesus and it is our responsibility to yield ourselves to that purpose for which we have been uniquely and perfectly made.